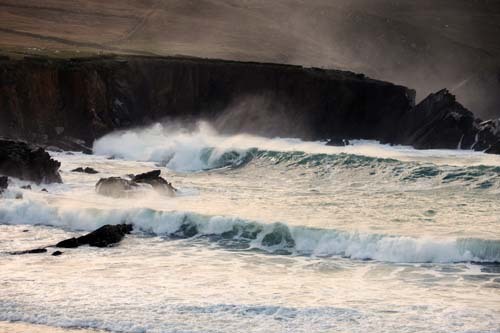 There are few places where waves crash so powerfully and consistently on the shoreline as the west of Ireland. The USA, South Africa, Australia and Chile have locations that might rival Ireland’s west coast for wave power potential, but none surpass it. If Ireland can find a way to better harness and store wave energy we have the potential to lead the world in this field and also create thousands of new, ‘sustainable’ jobs into the future. Waves are generated by the action of the wind on oceans. When wind speed is faster than the movement of waves at the ocean surface there is a transfer of energy from wind to wave. This transfer of energy can build up right across a large ocean, such as the Atlantic, with the energy eventually released, and lost to mankind, when a wave crashes onshore. The locations around the world where waves are strongest are on the western side of landmasses, large and small, from western Australia to western Ireland. This is due to prevailing westerly winds driving the waves ashore. These ‘westerlies’ are strongest during winter, and that is why wave energy too is more powerful during winter months. The current government in its ‘Ocean Energy Roadmap 2010:2050’ states that ocean energy can create 70,000 new jobs, provide a greater security of energy supply due to reduced reliance on gas from Russia and oil from the Middle East, reduced carbon dioxide ‘greenhouse gas’ emissions, and establish Ireland as a leader in ocean energy. There are huge efforts going on right now in many nations to develop technology that will allow, in the first instance, for the capture of wave energy. This is not a simple engineering problem to solve. For example, it is logical that wave energy is highest during a storm, but think of trying to develop machinery that can withstand and harness the power of an enormous storm hitting the west coast of Ireland in the depths of winter. The two leading wave energy firms in Ireland are Ocean Energy Ltd. from Cobh, and Wavebob from Maynooth. These firms have different approaches to the same problem. How to capture the energy locked inside waves, and to convert it into electricity. They have both tested their ideas first in a wave energy test tank at the Hydraulic and Maritime Research Centre, UCC, and in Galway Bay. The next step is the open ocean. 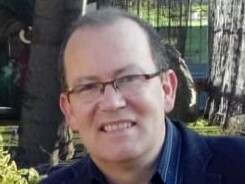 The Government’s policy of supporting Irish firms that wish to conduct research into the harnessing of wave energy has undoubtedly contributed to the success of Wavebob and Ocean Energy, and got them to such an advanced stage. These supports for indigenous Irish wave energy firms must continue and be accelerated by the incoming Government. The potential rewards are enormous if an Irish firm could win the technology race to commercially harness wave energy. A world’s first here for Ireland could establish it as the leader in wave energy. Wave power can provide for up to 40 per cent of our domestic electricity needs from waves. That would mean cheaper electricity for Irish homes and businesses, increase competitiveness, reduce our dependence on imports of fossil fuels, give Ireland greater control over its energy supply, and help us meet our greenhouse gas reduction targets. The potential benefits don’t stop there either. If a way could then be found to solve the ‘wave energy storage’ question, where wave energy could be stored, for example, on a stormy day and released for use as electricity on a calm wave-less day, ensuring consistency of energy supply, then the sky’s the limit. A solution to this tricky ‘storage question’ would mean that Ireland could meet 100 per cent of its electricity needs from wave energy alone, and still have lots of electricity over to export. The potential for wave power to provide all of our electricity needs and for Ireland to become an exporter of electricity is a feasible and exciting long term strategic goal. For that to be achieved, and it is within our capability to do it, the new Government should set out is own clear strategy to continue the good work in this area that has been done up to now. It would be a terrible mistake for the next Government not to continue the drive to make Ireland a wave energy leader. It is worth recalling here the fate of Ireland’s once promising wind energy sector. Like wave power, Ireland is blessed with an incredible wind energy resource, one that few nations can rival and, once upon a time, if the right steps were taken we had the potential to lead the world in wind energy technology. It never happened, as not enough supports were put in place to make it happen. This allowed Denmark to step forward to become the world’s wind energy leader. The Danes now are too far ahead of the rest of us to be caught up. The wind is in their sails now, and they are the world’s acknowledged wind technology leaders. Let’s hope the next government – despite all the distractions they will face – will not let history be repeated, and, through neglect, indifference or blindness to the vast potential of Ireland’s wave power, open the door for some other nation to become the world’s wave energy leader.